Since upgrading to Pro Tools 11 – I lost access to one of my favorite plugins – The Glue by Cytomic. The Glue is an analog modeled console-style Mix Bus Compressor that supports Side-Chaining and features a classic needle type gain reduction meter. This plugin gets high marks in the music production community. 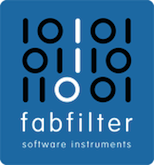 In my work I find it very useful on mix buses and to tame dynamics in individual clips. At this time there is no AAX Native version available, although I’ve read a release may be imminent. After using The Glue for about a year – I grew very fond of the form factor and ease of use. And, the analog gain reduction meter is just too cool. Here’s a video that demonstrates how The Glue can be used as a Limiter to tame transients. I have a bunch of Compressors that I use in Pro Tools including C1 by Waves and Pro-C by FabFilter. 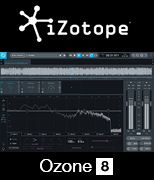 I also use the Compressors included in the Dynamics modules in iZotope’s Ozone and Alloy plugins. I decided to look around for a suitable replacement for The Glue that would work well in my Pro Tools environment. 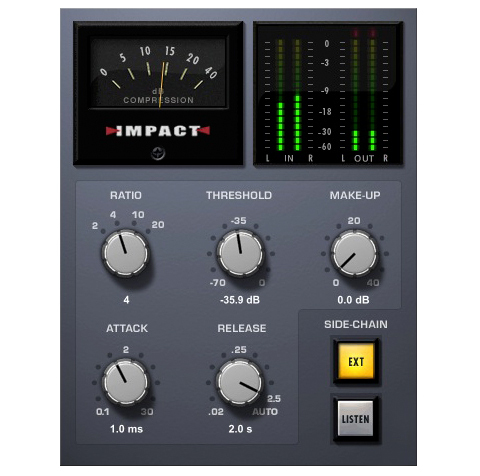 I was surprised when I stumbled upon something offered by Avid … Impact Mix Bus Compressor. Regardless, I’m looking forward to adding this new tool to my Pro Tools rig. We’ll see how well it stacks up against The Glue.